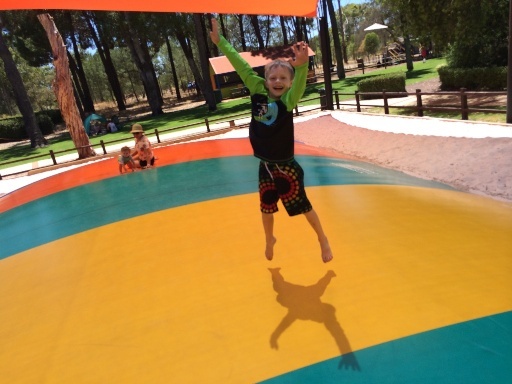 The Maze in Bullsbrook Perth is so much more than just a Maze If you are going to The Maze, make sure you plan to spend as much time there as you can because there is so much to do including the awesome Outback Splash waterslide playground in the warmer months. 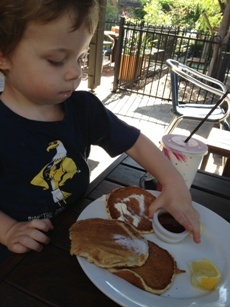 Why not get there early on a Sunday morning and enjoy breakfast. From 8am you can get breakfast at Cafe Iguana located outside The Maze entrance. 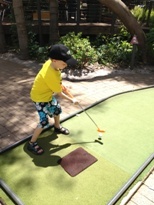 The cafe is surrounded by tranquil gardens and the mini golf course. 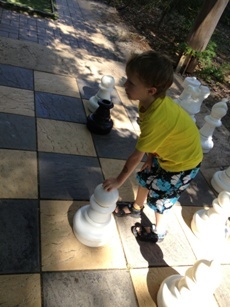 There's also a great giant chess board the kids will love to play while they wait for breakfast. Even if you do not wish to enter The Maze grounds, Cafe Iguana is a beautiful place to have sit down and have breakfast or lunch, and enjoy the tranquil surroundings. After hearing "When are we going into the maze?" for about the 10th time, we finished up breakfast and headed into The Maze grounds. 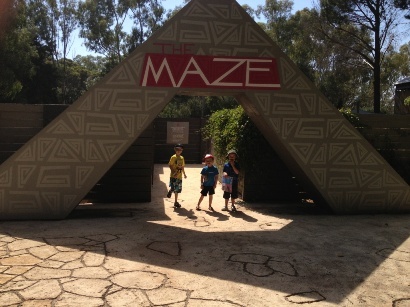 The boys were keen to conquer the main maze first. They loved leading the way and were eyeing off the tall fortress at the end the whole time. After lots of u-turns, and dead ends we found our way through the maze and the kids climbed to the top of the fortress for a great view of The Maze grounds, and were excited to find they could slide their way back down to the bottom. 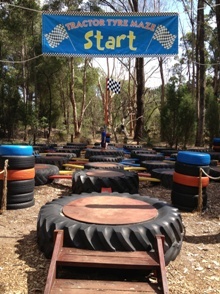 After completing the main maze we moved onto the jumping pillow. The kids loved it - and I couldn't resist having a go either. This giant inflatable pillow is amazing you get quite a workout bounding from one end to the other. Near the jumping pillow is a great place to set up for the day. There's heaps of shade, grass, seated areas and free to use barbeques. 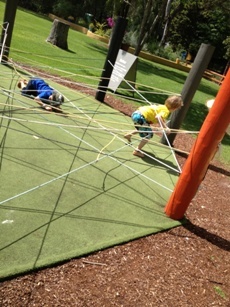 Around this area are other mazes the kids loved completing over and over again. Plus a little playground for kids under 10 yrs. But that's not all - you can see the Koala's at the enclosure and for an extra fee have a "Pat & Snap" opportunity (bookings required). 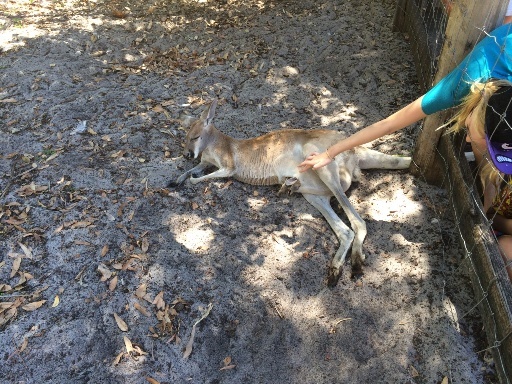 Wander through the large emu and kangaroo enclosure, there were a couple of little joeys still in Mum's pouch on our visit. We got up close and the kids loved seeing their cute little heads popping out. 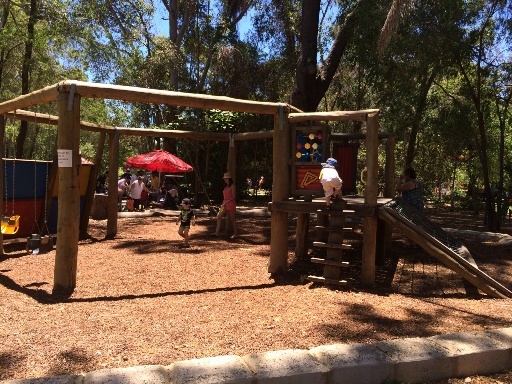 Everywhere you look there is something different to do and experience with lots of shaded seating around the garden, garden games to play and even camel rides (extra fees apply). 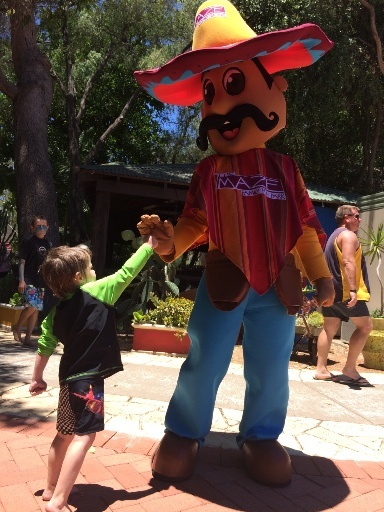 You can either take your own picnic lunch or barbeque along or enjoy a light lunch from Cafe Iguana - and if you have the energy after all that there is unlimited mini golf, included in the admission, to play too. 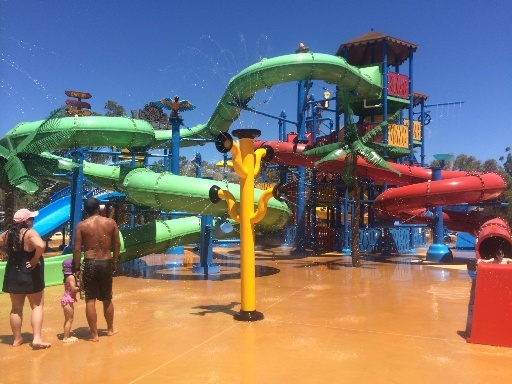 When it's time to cool off head to Outback Splash - a multilevel water slide playground designed specifically for young families. The main structure features a series of slides. 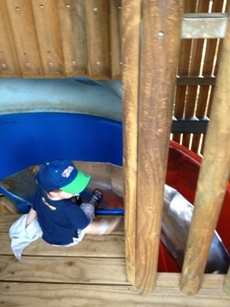 The small but wide blue slide, above on the right above, was most popular with my 3yo. He was able to ride it continuously as there was never a wait for this one. There are two other small slides on the the other side also. For the bigger slides, kids must be min 100cm to ride and there is no tandem riding. There are mats to ride the bigger slides, which are REALLY fast. There are a couple of open slides and a couple of enclosed slides which are very dark! The bigger slides might be a bit too scary for younger children, and of course if they are under 100cm they cannot ride these slides. 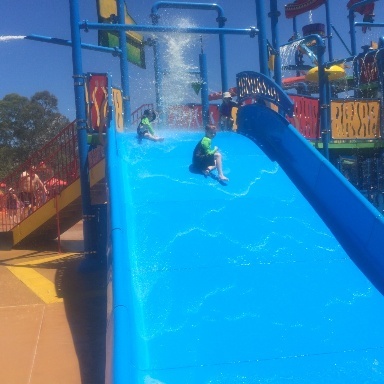 The lines for these slide started to grow after lunch, but there was no more than a 10 min wait, on the day we went which was a sunny 35 deg summer's day in the school holidays! There are also a few features around the bottom of the main structure for younger children - like the little fish slide (below) and several light water sprays. Oh and they had a DJ absolutely cranking out the most awesome tunes, so the atmosphere was amazing! You can also meet Pablo, just watch he doesn't get you with his water gun! 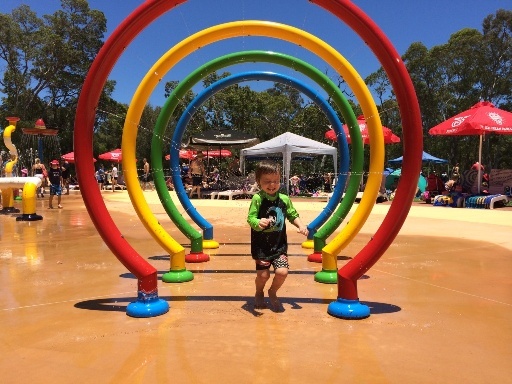 Young children need to be closely assisted and supervised in and around the Outback Splash waterslide playground as there is a large bucket of water that drops every 15mins or so! This can pack a punch and knock little ones not expecting it to the ground and there are also lots of bigger kids running around. Luckily it's lots of fun for parents too so this is no problem. 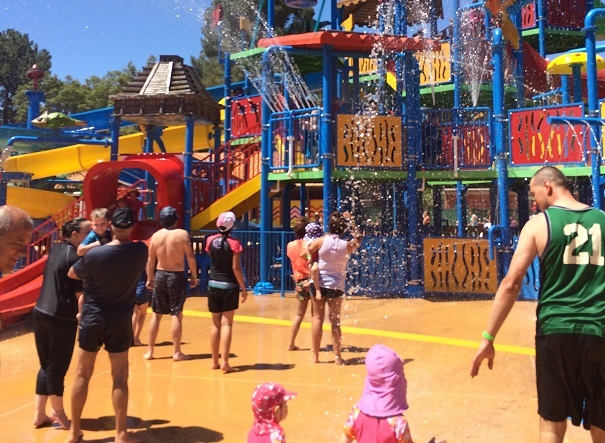 There are toilets, a parents room and first aid post located within the toilet block alongside Outback Splash as well as lockers available for 3 hr or all day hire, so you can lock away your valuables. 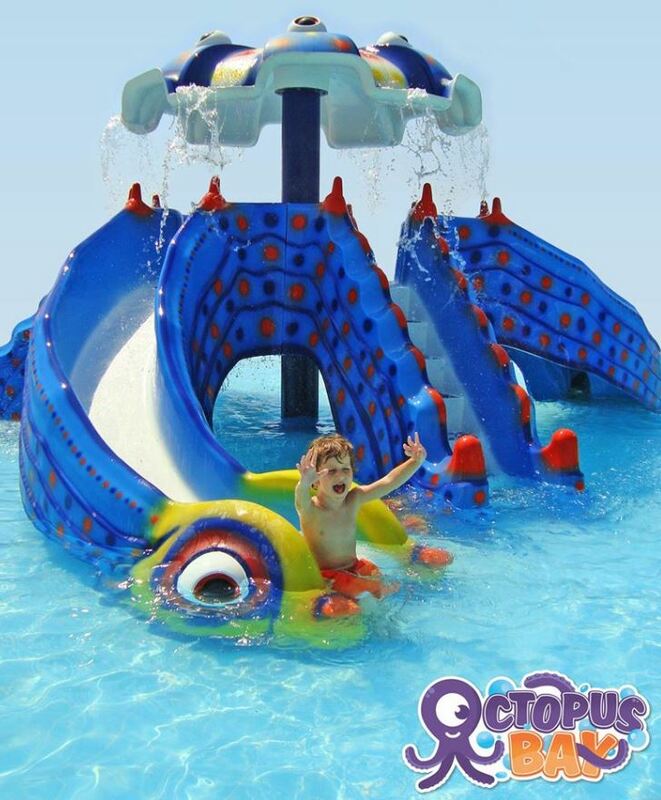 New in 2016 is Octopus Bay designed especially for toddlers and is set in a shaded 35 metre splash pool. 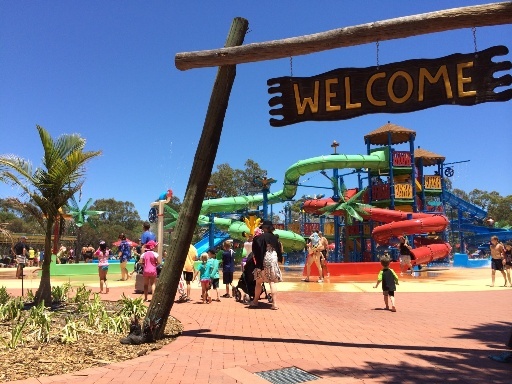 Octopus Bay features kid-friendly water activities including a 3-slide giant octopus and a miniature tipping bucket. 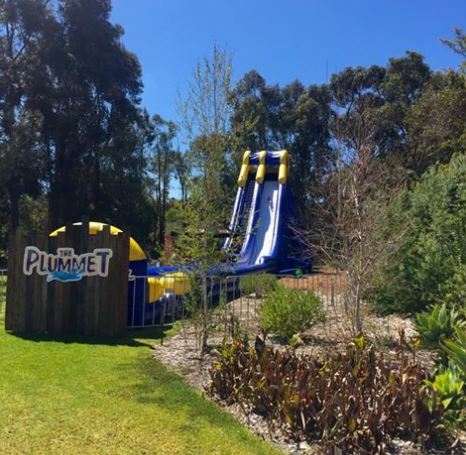 The giant inflatable water slide The Plummet is also a new addition and is a mazzive 10m tall and over 40m long. New in Summer 2019! 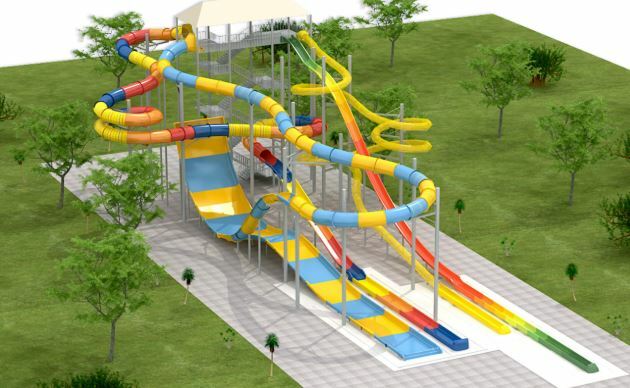 A waterslide tower complete with 2 raft slides and 2 speed slides. 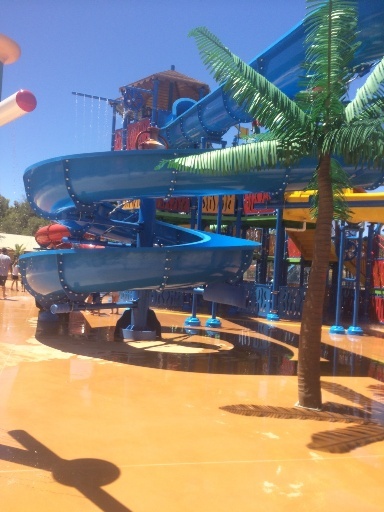 Check the Outback Splash website for updates on the open date. 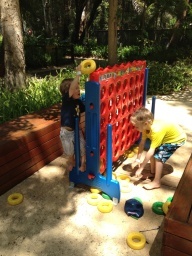 We all absolutely loved The Maze Home of Outback Splash - its a great place for families to enjoy doing something together and we highly recommend planning to spend the good part of the day there if you want to make the most of it - there's so much to do a couple of hours just isn't enough. 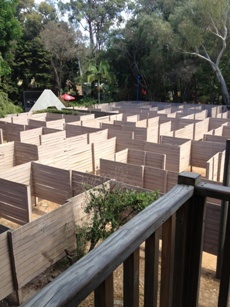 The Maze makes a great place to have a birthday party with catered and self catered packages available. Just remember you can bring your own food & drinks, so if you arrive early you can set up and spend the whole day at The Maze. This is the best way to get the best value from your admission fee. 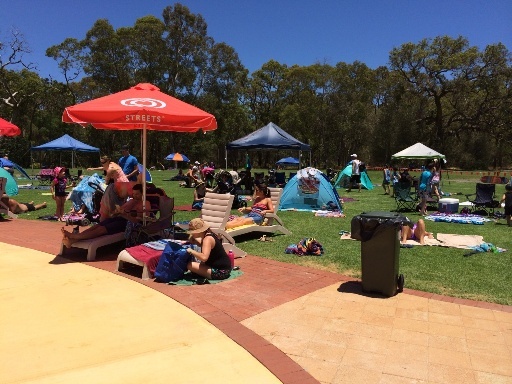 What to bring: picnic rug, eski with packed or bbq lunch, hats, sunscreen, fly repellent, stroller or pram if you have young children, bathers and towel. Note: you can bring alcohol, but you must be only consume in your picnic area. No alcohol consumption is permitted in the café, on the decking, near the café & ticket office or while playing mini golf, chess & disc golf.